Cinnamon has many benefits beyond cooking. Cinnamon--in both grated and essential oil forms--is beneficial to the skin because it brings blood and nutrients to the skin surface while also helping to dry skin. An article at organicfacts.net reports that cinnamon can be used to help dry acne and relieve an itchy scalp, but works best when applied in a preparation with an oil or petroleum jelly, which can moderate some of the harsh effects of cinnamon. 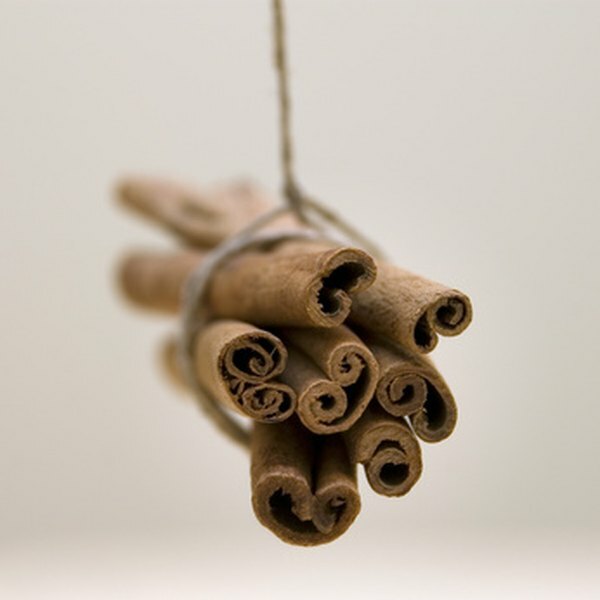 Cinnamon is a spice that brings blood to the surface of the skin, causing minor swelling and plumping. A preparation of three drops of cinnamon essential oil mixed with a couple tablespoons of petroleum jelly or olive oil can be applied to fine lines to plump out the skin, making the lines less visible. It's best to avoid the eye area as cinnamon can cause burning if it gets in your eyes. You may carefully apply it to the outside of crow's feet, away from the eye. This mixture is also helpful in plumping lips and can be used in place of lip gloss. Cinnamon can help clean and nourish the scalp by acting as an exfoliant and bringing blood to the scalp, and along with it, oxygen to nourish the hair follicles. Take 1 tsp. of ground cinnamon and mix it with 1 tbsp. of honey and 1/4 cup of warmed olive oil and apply to the scalp, massaging firmly during the application process. Leave on for about 15 minutes and then wash hair with your normal shampoo. You should feel a little tingle as the cinnamon stimulates the scalp. Some people have found relief from patches of eczema by combining 1 tsp. of honey mixed with 1 tsp. of cinnamon and applying a thin layer of the paste on affected areas. Do not use this preparation on children or on patches of eczema on the face. Try a small test area and wash off immediately if the skin becomes too irritated. You should see results within a week, according to an article on Earth Clinic.com . Cinnamon can help rid your face or back of acne by both drying out the skin and, again, bringing blood and oxygen to the skin surface. Mix 3 tbsp. of honey with 1 tbsp. of cinnamon and apply the paste to pimples and leave on overnight. Or apply a thin layer to the face as a mask and leave on for about 20 minutes before rinsing with warm water. Cinnamon masks can irritate the skin, so they should not be applied more than once a week.